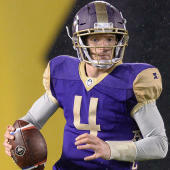 The AAF, first and foremost, is a league designed to develop. That applies to everyone: players, coaches, even officials. Getting them to (or back to) the NFL is the main goal. Yes, winning is important, but it's sort of a 1A/1B goal with development. Still, the Alliance has a regular season, playoffs and a championship game, so there's something to play for at the end of it all. As the second half of the season gets underway, we'll be tracking how all eight teams are doing in the playoff hunt from best to worst. The four-team playoff will be held on the weekend of April 20 with the higher-seeded teams hosting semifinals. The championship game will be held in Las Vegas Frisco on April 27. Check out where every team stands below heading into the weekend. You can also view expanded standings here and the remaining schedule here. Orlando Apollos (6-1 overall, 4-0 vs. division): The Apollos locked up a playoff spot last week with a win over Atlanta and can secure the top seed in the East with a win against Memphis. It would be a surprise if they don't. San Antonio Commanders (5-2 overall, 3-1 vs. division): The Commanders aren't in the clear yet, but they're as close as you can come. This weekend will determine a lot and the nightcap for Sunday's action is a monster game between San Antonio and Arizona. The Commanders can lock up a spot with a win against the Hotshots and a San Diego loss to Salt Lake. Birmingham Iron (4-3 overall, 2-2 vs. division): The Iron giveth and it taketh away. A thrilling win at San Diego in Week 6 was followed up by a brutal loss to Memphis in Week 7, courtesy of a blown lead that led to the first overtime game in AAF history. Still, Birmingham will make the playoffs with a victory against Atlanta in Week 8. The top seed in the division is likely out of the picture, though. Arizona Hotshots (4-3 overall, 2-2 vs. division): Arizona is probably one of the two best teams in the West, but a win on Sunday at San Antonio could go a long way in proving that. The Hotshots also wouldn't complain if the Fleet lost at Salt Lake. That would make things for Arizona a little easier. San Diego Fleet (3-4, 2-2 vs. division): San Diego is in a bit of a tough spot. It's still in the playoff race, but also a slight underdog on the road against the Stallions in Week 8 -- and Salt Lake has been a much better home team. The Fleet need a win here to stay within striking distance of either the Commanders or Hotshots. Salt Lake Stallions (2-5 overall, 1-3 vs. division): The Stallions' inability to win on the road is probably going to be the death of them. Salt Lake is a field goal favorite over the Fleet, and certainly a win would help, but it would take three straight wins and some assistance elsewhere for the Stallions to have a real shot at the playoffs. Atlanta Legends (2-5 overall, 1-3 vs. division): The Legends have lost their last two games by a combined 61 points. Birmingham can put them out of their misery for good on Sunday. Memphis Express (2-5 overall, 1-3 vs. division): The Express kept whatever slim playoff hopes they had alive with a come-from-behind win against Birmingham in Week 7. However, they need to follow that up against Orlando in Week 8 for it to stay that way. Those ... aren't great odds. Maybe that means we'll get to see more of Johnny Manziel then? No team has been eliminated from playoff contention.